Today (Aug. 3), NASA announced the astronauts who will fly on SpaceX's and Boeing's first crewed test flights. Former astronauts were among the many to congratulate the new crews. 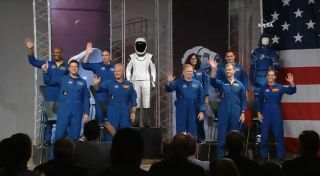 Today, NASA announced the first astronauts who will launch aboard the first crewed spacecraft built by SpaceX and Boeing — and other spaceflyers were quick to congratulate the new teams. NASA astronaut Ricky Arnold was one of the first to offer the chosen astronauts a hearty congrats. Arnold expressed his sentiments in a video tweeted by the ISS team. "We soon will enter a new era of human spaceflight," he said in the video. "Once again, we'll be launching to and from the International Space Station from American soil on American spacecraft." The two missions from SpaceX and Boeing will be the first to launch from the U.S. since NASA's last space shuttle launched, in 2011. U.S. astronauts currently rely on Russian Soyuz spacecraft to get to and from orbit. Arnold continued: "To that end, we congratulate our friends and colleagues who have been assigned to these pathfinding commercial missions. We should all be excited and proud of what we do as Americans in forging the next chapter of human spaceflight. It will be a thrilling chapter indeed." In addition to sending his congratulations in the video, Arnold also expressed his support for the new crews in a tweet on his personal Twitter account. NASA astronaut Karen Nyberg also offered her good wishes to the astronauts on Twitter. She specifically congratulated her husband, Col. Doug Hurley, who is also a NASA astronaut and among those who will be launching with the SpaceX team. Other astronauts and astronaut candidates also added their congratulations. Jasmin Moghbeli, a NASA astronaut candidate, shared her support, saying, "What a great time to be involved in human space exploration!" Non-astronaut William Seely, the U.S. Marine Corps director of communication (public affairs), made sure to offer his support and congratulations to NASA astronaut Nicole Mann. A former Marine Corps test pilot, Mann is a new member of Boeing's team who will be launching to space for the first time. All around the world (and even in space), astronauts and non-astronauts alike continue to show their excitement and support for the talented individuals chosen for these groundbreaking missions.